Why are the mainstream media giving Theresa May an easy ride over her endorsement of homophobic bullying? As a result of his decision to blow the whistle on Brexit campaign cheating Theresa May's aides revenge outed the whistleblower as gay (putting his family in Pakistan in danger). Not only did Theresa May refuse to apologise to the victim, but she actually expressed her "full confidence" in the perpetrator! Just try to imagine the storm of mainstream media outrage if a Labour employee had done this, and then Jeremy Corbyn had actually endorsed such grotesque homophobic bullying by refusing to apologise to the victim and actually issuing a statement of confidence in the perpetrator. The mainstream media reluctance to call out this ridiculously clear cut demonstration of Theresa May's tolerance towards the use of bigoted homophobic bullying tactics is one of the reasons that so many people have completely lost faith in professional journalism. There is absolutely no way Theresa May should be getting an easy ride over this from the mainstream press, especially given that the subject of bigotry in politics has been deliberately pushed to the forefront of political debate as a means of stopping the public from talking about the way toxic Tory austerity dogma has completely ruined local government services up and down the country and left numerous councils in a state of de facto insolvency. If you're going to call out bigotry that's great. But if you're only doing it for the purpose of undermining Jeremy Corbyn's leadership of the Labour Party whilst you ignore the immediate and absolutely incontestable evidence of Tory bigotry and bullying scandals, including Theresa May's endorsement of homophobic bullying tactics, then you're no ally of the oppressed at all. You're just a cynical opportunist who uses other people's actual suffering to score partisan political points. 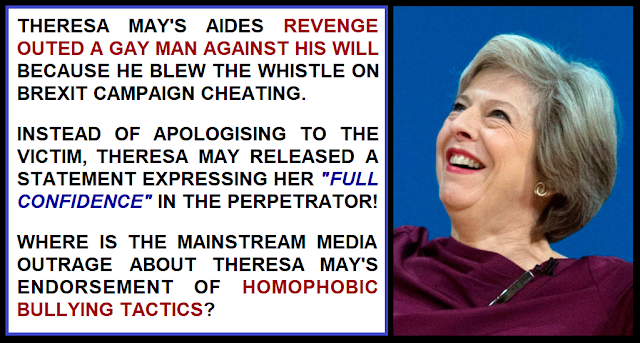 And with their unwillingness to treat this homophobic bullying scandal right at the heart of Theresa May's government with the seriousness it deserves, especially after all the coverage they lavished on the Labour anti-Semitism row, it makes it look an awful lot like a lot of mainstream media hacksare far more interested in partisan political point scoring on behalf of the Tory party than actually confronting bigotry in politics.